Could there be intelligent life in the star system KIC 8462852? A recent analysis of data collected by the Kepler space telescope has shown that this star, informally known as Tabby’s Star, evidences aperiodic dimming of 20 percent and more. While several natural explanations for this strong change in luminosity have been proposed, one possibility is that a technologically adept civilization has built megastructures in orbit around star, causing the dimming. The Ĝ Search for Extraterrestrial Civilizations with Large Energy Supplies. 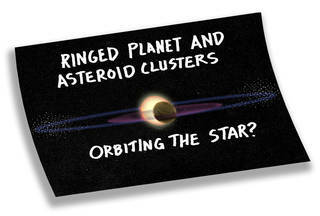 Was it a catastrophic collision in the star’s asteroid belt? A giant impact that disrupted a nearby planet? A dusty cloud of rock and debris? 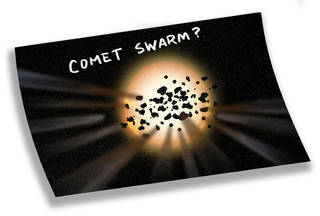 A family of comets breaking apart? 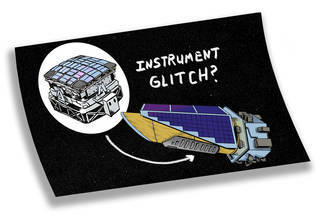 Or was it alien megastructures built to harvest the star’s energy? 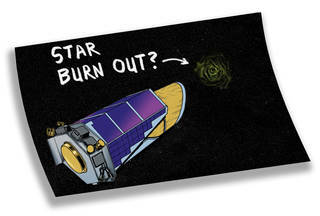 Those citizen scientists were highlighting measurements of star brightness recorded by NASA’s Kepler spacecraft. Tiny dips in a star’s brightness can indicate a planet is passing in front of the star. That’s how Kepler astronomers – and citizen scientists using the internet to help analyze the light curves of stars – are looking for planets. 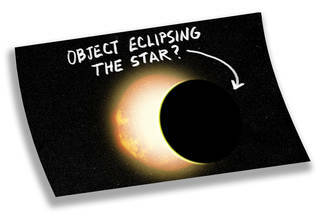 But this star had deep dips in brightness – up to 22 percent. The star’s brightness also changed irregularly, sometimes for days and even months at a time. A search of the 150,000-plus stars in Kepler’s database found nothing like this. 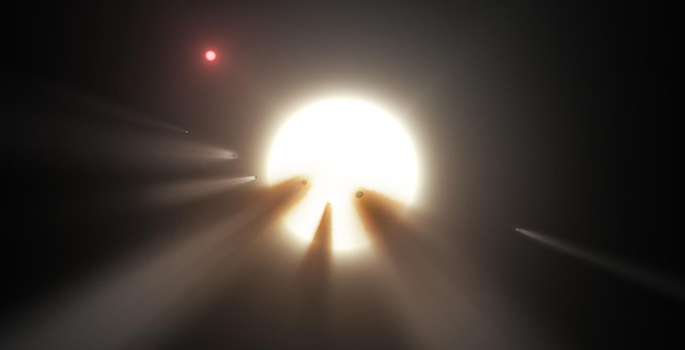 The anomalous star KIC 8462852 has baffled astronomers with its erratic dimming, causing some to speculate that it’s orbited by a massive structure built by an extraterrestrial civilization. To help evaluate that possibility, scientists searched for brief laser pulses from the distant star, but found none, as reported in a paper submitted to The Astrophysical Journal Letters. “The hypothesis of an alien megastructure around KIC 8462852 is rapidly crumbling apart,” said Douglas Vakoch, President of SETI International and an author of the paper. “We found no evidence of an advanced civilization beaming intentional laser signals toward Earth,” he explained. The experiment was coordinated by SETI International, a new research and educational organization devoted to innovative approaches to astrobiology and the Search for Extraterrestrial Intelligence (SETI), including Active SETI, in which intentional signals are sent to other stars to evoke a reply. Sorry, E.T. lovers, but the results of a new study make it far less likely that KIC 8462852, popularly known as Tabby’s star, is the home of industrious aliens who are gradually enclosing it in a vast shell called a Dyson sphere. Public interest in the star, which sits about 1,480 light-years away in the constellation Cygnus, began last fall when Yale astronomer Tabetha (Tabby) Boyajian and colleagues posted a paper on an astronomy preprint server reporting that “planet hunters” – a citizen science group formed to search data from the Kepler space telescope for evidence of exoplanets – had found unusual fluctuations in the light coming from the otherwise ordinary F-type star (slightly larger and hotter than the sun). I'm not surprised to hear that a likely natural explanation has been found for KIC 8462852. It would have been so utterly unlikely if the unique light variations of this star had been caused by something as incredible as a real Dyson sphere. Then again, in view of what kind of alien life forms we have a reasonable chance of detecting, one might argue that the very simple, bacteria-like life forms and the incredibly advanced aliens are the ones we have the best chances of finding. The bacteria-like life forms are the ones that may change the composition of the atmosphere of their planets, and the incredibly advanced aliens are the ones that might build Dyson spheres and change the light output of their suns. It is fascinating to think of, in any case. The researchers analyzed further Kepler observations of the puzzling star and showed that in addition to its rapid unexplained brightness changes, the star also faded slowly and steadily during the four years it was watched by Kepler. Tabby’s star has provoked so much excitement over the past year, with speculation that it hosts a highly advanced civilization capable of building orbiting megastructures to capture the star’s energy, that UC Berkeley’s Breakthrough Listen project is devoting hours of time on the Green Bank radio telescope to see if it can detect any signals from intelligent extraterrestrials. 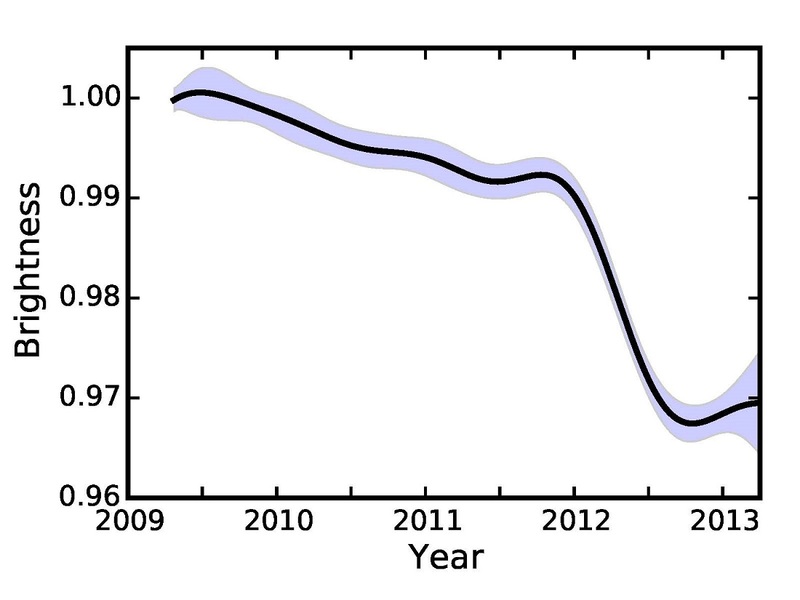 Called KIC 8462852, also known as Boyajian's Star, or Tabby's Star, the object has experienced unusual dips in brightness -- NASA's Kepler space telescope even observed dimming of up to 20 percent over a matter of days. 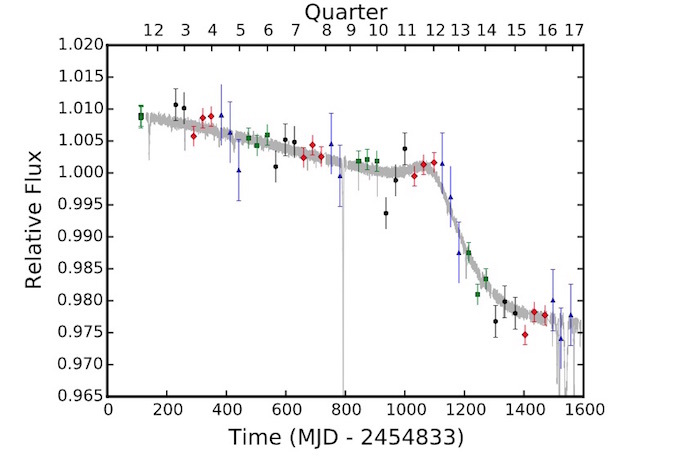 In addition, the star has had much subtler but longer-term enigmatic dimming trends, with one continuing today. None of this behavior is expected for normal stars slightly more massive than the Sun. 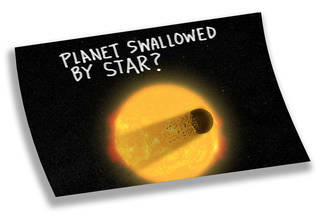 Speculations have included the idea that the star swallowed a planet that it is unstable, and a more imaginative theory involves a giant contraption or "megastructure" built by an advanced civilization, which could be harvesting energy from the star and causing its brightness to decrease. Weird. I thought the dust theory got thrown out at a very early stage because the infrared measurements were exactly wrong for what one might expect for dust. Epsilon Aurigae (ε Aur, ε Aurigae), also named Almaaz, is a star in the northern constellation of Auriga. It is an unusual eclipsing binary system comprising an F0 supergiant and a companion which is generally accepted to be a huge dark disk orbiting an unknown object, possibly a binary system of two small B-type stars. About every 27 years, Epsilon Aurigae's brightness drops from an apparent visual magnitude of +2.92 to +3.83. This dimming lasts 640–730 days. In addition to this eclipse, the system also has a low amplitude pulsation with a non-consistent period of around 66 days. It would seem that Tabby's Star is not the only F-type star acting up by dimming due to dust. Myself, the old cynic, never for a moment believed that the dimming of Tabby's star was due to an artificial alien mega-structure. Wouldn't it have floored me if the mega-structure had actually been there. 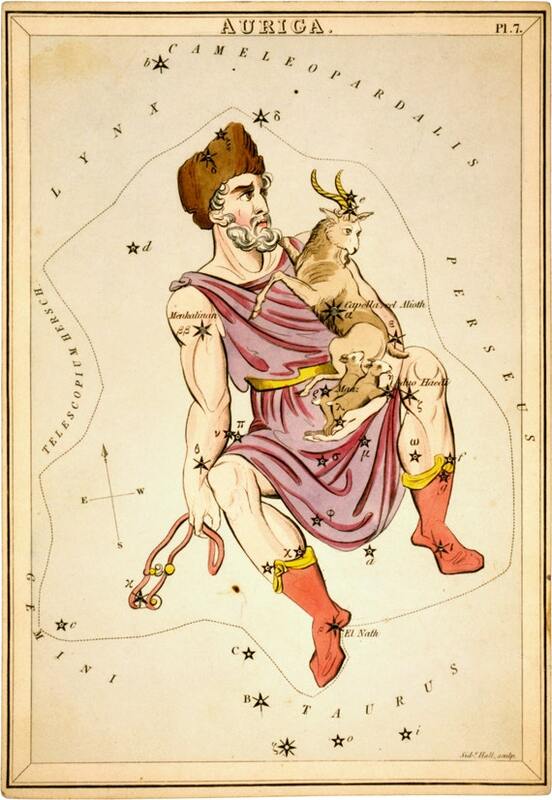 Epsilon Aurigae (ε Aur, ε Aurigae), also named Almaaz, is a star in the northern constellation of Auriga. It is an unusual eclipsing binary system comprising an F0 supergiant and a companion which is generally accepted to be a huge dark disk orbiting an unknown object, possibly a binary system of two small B-type stars. About every 27 years, Epsilon Aurigae's brightness drops from an apparent visual magnitude of +2.92 to +3.83. This dimming lasts 640–730 days. 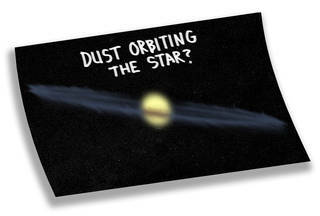 My first and only hypothesis regarding this star was an irregular cloud of dust. I specifically remember looking it up and wondering why it wasn't the leading hypothesis already, and it was because the light signature was just wrong. This really confuses me. My first and only hypothesis regarding this star was an irregular cloud of dust. A fiery horse with the speed of light, a cloud of dust and a hearty Hi-Yo Silver! The Marlboro cowboy and his horse on steroids? Some 1,500 light-years from Earth, a mystery of stellar proportions is playing out. A singular star out there captured scientists’ and the public’s imagination in September 2015 with its strangely fluctuating brightness. Ever since then, the scientific community has been observing this enigmatic character and sifting methodically through the data in search of an answer. Certain explanations are eliminated, while other likely suspects come to the fore. Meanwhile, the world has the chance to watch, as the scientific process and the mystery continue to unfold. The most recent findings, based on the new data from Spitzer and Swift, point the finger at an uneven dust cloud orbiting the star to explain the long, slow dimming of the star, which may prove related to the short dips in brightness. As for the latter, one study has suggested that a star orbited by a ringed planet and clusters of asteroids could exhibit the same strange dimming behavior. Yet another has considered a planet being pulled apart and swallowed up by the star. These relative newcomers to the mystery have followed other explanations previously put on trial by scientists for the strange behavior of Boyajian’s star. Here are a few of the “accused,” and the evidence that exonerated them. A team of more than 100 researchers, led by LSU Department of Physics & Astronomy Assistant Professor Tabetha Boyajian, is one step closer to solving the mystery behind the “most mysterious star in the universe.” KIC 8462852, or “Tabby’s Star,” nicknamed after Boyajian, is otherwise an average star. It is about 50 percent bigger and 1,000 degrees hotter than the Sun. It is more than 1,000 light years away. However, it has been inexplicably dimming and brightening sporadically like no other. 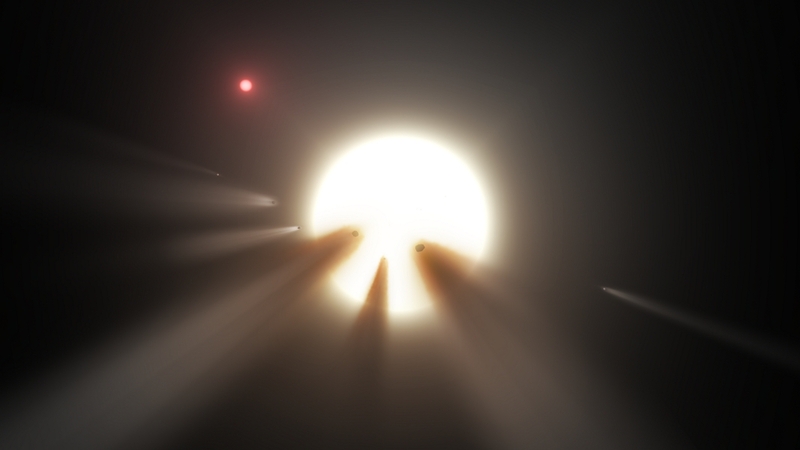 Several theories abound to explain the star’s unusual light patterns including an alien megastructure orbiting the star.